Eggplants… in my mind one of the ugliest vegies in the Yummy Yard fleet! Of course, my colleagues here disagree, but seeing as I am writing this and they’re not, I guess I can say what I like! I grow eggplants not for the aesthetics, but for the exquisite flavour and versatility of a home grown eggplant. So, here’s how you can do it too! Now, here’s a bit of info you can use at your next trivia night… eggplants and tomatoes are related (just like cousins)! Position wise though, eggplants vary from tomatoes in that they like it warmer… a fair bit warmer. Eggplants can’t handle frosts at all, and, like me, they hate long periods of cool weather. Stick a few in a beaut sunny spot in the garden and leave about 50cm between them, as they can get pretty big. They’ll thank you for it! Due to the family ties between eggplants and tomatoes (and potatoes and chillis), we need to remember the following two things: they love what tomatoes love, and they can’t be planted where tomatoes (or their other rellies) have been for at least three years. Check out the Companion Planting chart here for other good and bad neighbours. So, just like tomatoes, top eggplants thrive in a fertile soil, rich with compost, pelletized poo and topped with a layer of straw. Eggplants will do even better if the bed is prepared for them a month before planting out, so whack it all in and count the days. The tip here is to ensure the soil drains freely, and isn’t too heavy (meaning really dense or clay). As with most Yummy Yards plants, ensure that the mulch is not pushed right up to the stem, as this can lead to collar rot and all sorts of nasties! Feeding your eggplants with poultry poo based granules just as the flower buds appear will do “eggsalent” things for the yield of your plants. If you feel the need to feed, and you missed the bud stage, make a chook poo tea by soaking poo pellets in water, and giving it to your eggplants to drink. Other than that, the beaut rich soil in the bed you have prepared should provide a far whack of nutrients to these tasty tackers! 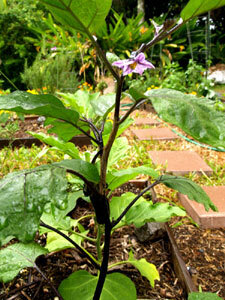 Eggplants, like most Yummy Yardies, do not like to dry out, so keep a close eye on the soil moisture. Left to dry out, eggplants can produce hideous, misshapen fruit, making ugly even uglier… so, for the sake of a good looking garden, just don’t do it! Once again, a nice mulch layer will assist. Generally speaking, my eggplants take about 13 weeks to mature, bearing in mind that I live in the second coldest place on earth (second only to my lawyer’s office… that’s a joke, Mum). Eggplants can take varying lengths of time to mature (can’t we all), but, depending on variety, between 10 – 14 weeks is the norm. These guys are ready to roll when they are big enough to use, are firm, and the skin is glossy. Don’t leave them on the plants too long, as they can over ripen and go wrinkly, which makes them even uglier, and not so tasty! Like their cousin tomatoes, eggplants need to stake their claim, and must be well supported in order to be productive and upstanding. 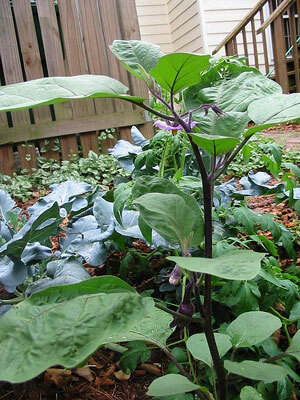 Staking eggplants, especially the bigger fruiting varieties, prevents the vegetable equivalent of the “Dolly Parton”, where the plant becomes so top heavy with eggplants it is unable to support itself. Nice solid tomato stakes, driven into the ground about 10 centimeters away from the stem of the plant should do it. Join the stake and the stem together with an old stocking (don’t tie it too tight) and you’ll find this is the beginning of a fruitful and supportive relationship. Eggplants don’t seem to suffer from an enormous amount of pest and disease issues, but, being related to tomatoes and friends, they are susceptible to the same suite of pests and problems. That said, diverse Yummy Yards, full of tasty treats and pretty plants, will attract a range of good bugs to your patch. These guys will make short work of loads of pest outbreaks. The other hot tips are a consistent watering regime, and crop rotation. Don’t plant these guys in a patch where tomatoes, chillis, eggplants or potatoes have been in the last two years… this lessens the possibility of disease. Also, Companion Planting and tomatoes go hand in hand. Now, if all this fails and you do have an issue, never fear, Sustainable Gardening Australia is here! Below is a list of common issues, their causes, and a couple of solutions for eggstra-odinary eggplants! 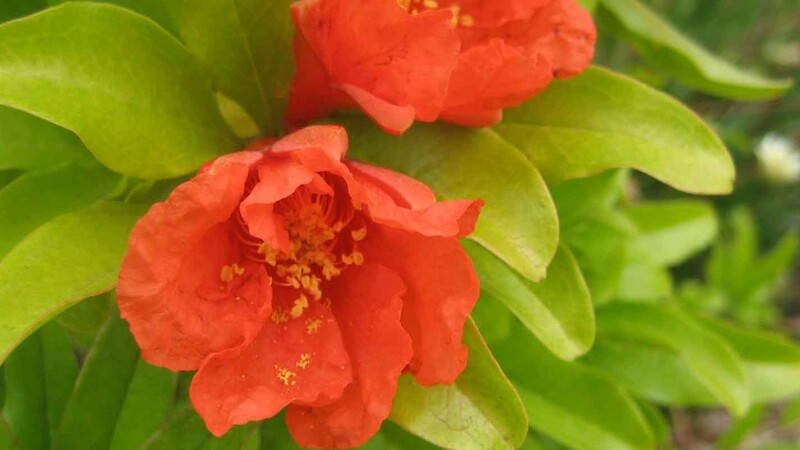 Flowers fall off before the fruit forms – Could be caused by loads of things, including too much or not enough water, not enough light, over fertilising (I tried to warn you), possums or thrips. Check flowers for thrips, and, if you find them, click here for what to do next! Leaves wilting – Ummmm… did you water your plants? This generally happens when humans are overcome by laziness, or holidayitis! Especially common during summer school holidays! Also, check to see that the eggplants are not mulched right up to the stem… this can cause awful things to happen! White powdery patches on upper surfaces of leaves – Ahhh, me old mate powdery mildew! Often caused by water hanging around on the leaves of plants. Try to water the soil, rather than the foliage. Remove affected leaves and put them in the bin, not the compost. Click here for tips! Holes in your leaves – Pretty sure it’s caterpillars. Really ugly wet looking patches on the eggplant – It’s probably Blossom End Rot (if it’s at the bottom end) of the eggplant. Plants falling over – did you read the ‘stake ya’ claim’ segment? And have you planted your eggplants in a wind tunnel? They don’t stand up to wind real well! Now, one other issue that effects eggplants is fruit fly… these little devils love an eggplant grown in some of our warmer climes. I say warmer climates because the fruit fly maggots like to pupate (that means change from maggots to flies) in warm soil, and, like most southern gardeners, are not big fans of cold soil. This is great news for us in the cooler climes, but not so flash for those in warmer spots. So, my top tips for sustainable fruit fly control can be found here, but, before you head off, remember a great place to start is with garden hygiene. Remove any fallen or infested fruits; bag them up and ditch them in the bin… that’s an excellent discouragement for fruit fly larvae. Now, don’t get me wrong, it’s not all about looks (goodness knows I am well aware of that), but when it comes to eggplants, there are some really “out there” looking varieties and cultivars available. We all know about the big old “Deep Purple” varieties, but this is just “Smoke on the Water” (end of corny 1970s music reference)! 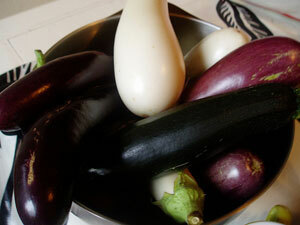 Eggplants come in pink, white, stripped, green, lavender and intriguing combinations of the above. So, head to your local SGA garden centre to see what’s available. Go on, put some crazy colour in your garden, your mates will be impressed! Why not try some other varieties as well, like Lebanese eggplants (you know, the long, skinny ones). These are dead easy to grow, and go really well in pots or containers. Because they have fruit of a smaller size, they are quicker to harvest so are good for climate with shorter summers. Oh, and while you’re at the garden centre, why not have a look at the grafted eggplants now available. These are said to be more disease resistance, more vigorous, and have a higher fruit production… why not try one and see! But wait… there’s more! I was always told that eggplants needed to be soaked in salty water, then “de-gorged” under weight and left to stand before being ready to use. What a massive pain in the neck that ends up being, as anyone who has done it can testify. Well, here’s the big scoop: it’s not true!! Only the bigger, purple coloured eggplants need this, particularly if you have let them go a bit wrinkly and past it! The cute little Lebanese and Thai eggplants, along with many more of the smaller varieties don’t need it, so here’s my hot tip: Grow the wee ones, and save yourself the effort! Place shitake mushrooms in a heatproof bowl and cover with 1 ½ cups boiling water. Allow to soak while you prepare the rest of the meal. Crush garlic and grate ginger. Cut eggplant into thick wedges. Toss eggplant in 2 Tb of the oil. Heat a large saucepan or wok over high heat. Add eggplant wedges and cook over high heat until golden and soft. Try not to stir the eggplant too much but turn it methodically with tongs so it browns on all sides. Turn heat to low. Add garlic and ginger and stir for 1 minute. Add remaining oil, soy sauce, wine, sugar and sesame oil. Strain the mushrooms, but reserve all of the cooking water. Add 1 cup of the mushroom soaking liquid to the saucepan. Cut stems of shitake mushrooms and save to compost. Add mushroom caps to the saucepan. Bring mixture to the boil, then reduce heat to a simmer. Simmer for 30 minutes. This is best served with homegrown Asian greens such as bok choi or choi sum. Simply stirfry with garlic and any left over mushroom stock.